seasonal trips up the ladder and onto the roof and experience the LeafGuard® advantage today. What’s Wrong With Clogged Gutters? Ordinary gutters capture rainwater, but they also collect leaves, twigs and other organic debris that can become clogged and impede the flow of water. Clogs cause water to spill over your gutter and pool on the ground below, resulting in damage to your shrubs, surface erosion, and moisture seepage into your foundation causing cracks and basement flooding. And don’t underestimate the danger of clogs attracting pests. Some critters are attracted to the acorns and seeds that can collect in your gutters. Insects, mold and bacteria can grow in standing water and wet clogs. Only LeafGuard® Gutters carry water away from your home with a patented, debris shedding design that is better than any other gutter on the market. With LeafGuard® clog free gutters, you can forget about water damage, surface erosion, and climbing ladders. 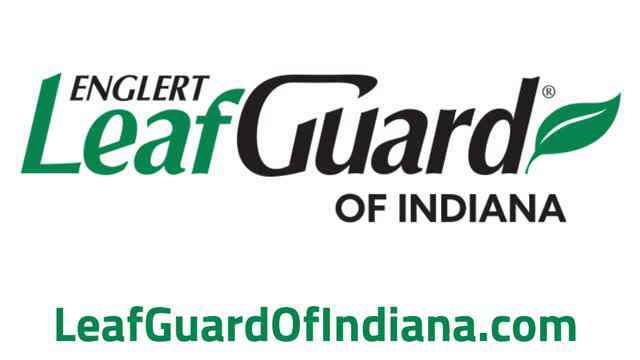 LeafGuard® Brand Gutters are guaranteed not to clog for as long as you own your home, or LeafGuard® of Indiana will clean your gutters free of charge. The LeafGuard® gutter system works on the scientific principle of Liquid Adhesion. As liquids flow, they adhere to the surface they are traveling across – especially when the surface is curved or round. The LeafGuard® gutter’s patented design allows rainwater to travel down and around its curved hood and into the gutter, while deflecting leaves and debris. Not valid with any other offer or previous job. Present coupon at time of estimate. Call office for details. Limited time offer.